Unibet is part of the well-known Microgaming poker network. Unibet has been in the online gaming industry since 1997, and is licensed by the Lotteries and Gaming Authority (LGA) of Malta. Unibet Group Plc is a publically listed company which trades on the NASDAQ OMX Nordic Exchange in Stockholm. Taking all these points into account, Unibet is a solid choice for your online gaming needs. Unibet boasts a wide range of poker games, including No Limit Holdem, Limit Holdem, Pot Limit Omaha, Pot Limit Omaha Hi-Lo, 7 card stud, 5 card stud, 5 card draw and Razz. Most of the action is at shorthanded (6 max) tables, but there are also heads up tables and the occasional full ring table running. Stakes range from €0.02/.04 to €50/100 for most games, so players will always be able to find games in their comfort zone and beyond. The average amount of players connected to the site is approximately 1,200, with about 2,500 at peak times. Their daily tournaments typically get between 100 and 400 players. Their largest regularly scheduled Sunday tournament boasts a €75,000 guarantee with a buy in of €200+20. Unibet also runs satellites to major live events such as the WSOP, World Sit ‘n’ Go Masters in Prague and their own Unibet Open London tournament. The Microgaming network software leaves a bit to be desired, but it isn’t too hard to navigate to find the games you want. The games are broken down nearly into sections for Cash Games, Blaze Poker (their version of Rush/speed poker), Sit & Gos and Multitable tournaments. Within each section you can check the types of games (eg 6max, heads up) you want as well as the stakes. There is a handy button at the bottom which allows you to clear your selections, to in essence make a new “search” of the games you’d like. Tables can be sorted by any of their headings, such as # of seats, average pot size and % of players seeing the flop. The game tables are resizable, and there are Table Display options in the lobby which will automatically tile or cascade all of your open tables. 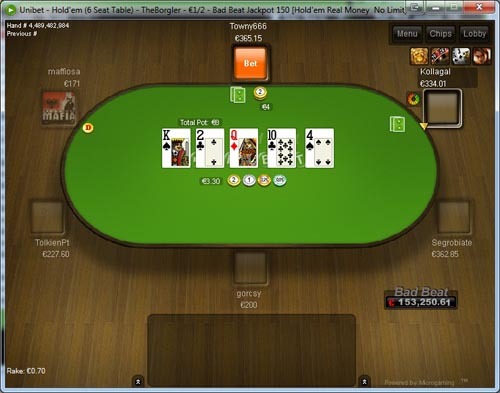 This is a nice feature which allows you to multitable with ease, up to 10 tables at a time! Since adopting 6max games as their bread and butter, the action on Unibet has gotten much better. There are plenty of loose games with decently large average pot sizes. There are still quite a good number of fishier players at Unibet. They like the 6max action, as well as the various game promotions available. The Unibet Poker bonus of bonus of up to €500 is available to all new players! The bonus will clear depending upon the amount of rake you generate during your first 60 days at the tables. The amount of your initial deposit doesn’t matter. There’s no need to enter a code to claim this bonus. Sign up with our Unibet links, and make your deposit. Then start playing at the tables, and your bonus will be automatically credited as you earn it. Unibet also rewards its players with a unique Challenges system. You’ll have to achieve certain goals during your cash game play to earn loyalty points, which will grant you tournament tickets, cash rewards, and other prizes as you reach certain point levels. SNG/MTT players receive 100 points per € in tourney fees paid instead of completing challenges. 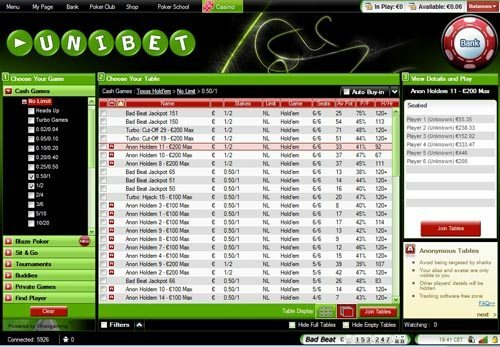 Unibet Customer Service is available 24/7, 365 days a year through a variety of contact methods. Live chat is the most convenient and free. Email, UK freephone and international phone are also available.